Would you like to own Cap's shield? Glorious 24-inch diameter prop replica! Captain America's first line of defense… and offense. The perfect addition to any man cave, trophy room, or collector cavern! 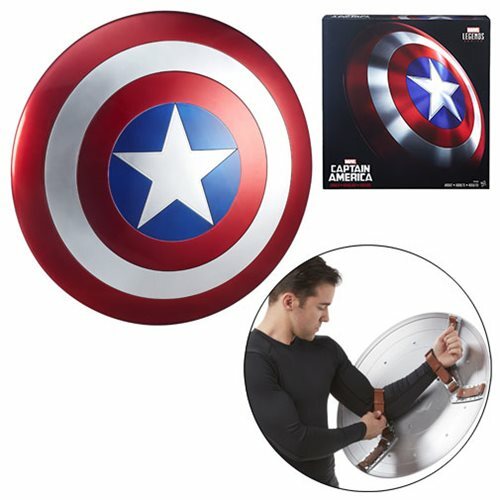 From the people who brought you Marvel Legends action figures, comes this massive Marvel Legends Gear Captain America Shield Prop Replica! The supersoldier's first line of defense… and offense… is made of the finest Vibranium substitute known to modern man (plastic) and comes to you with a gorgeous paint job. You don't want to miss this terrific 24-inch diameter shield, as it's the perfect addition to any man cave, trophy room, or collector cavern. Please note: It will not protect you against attacks, but it should deftly deflect NERF darts (sold separately). Ages 13 and up.